Some users believe that editing the text in the left hand side of the translation grid will affect the original document. This is not the case. When Déjà Vu imports a document into a project, it makes a copy of the document's text to store in the project, and thereafter does not use the original document again for anything. Therefore, making changes to the source text in the document will not affect the original document at all. What is source segment locking? 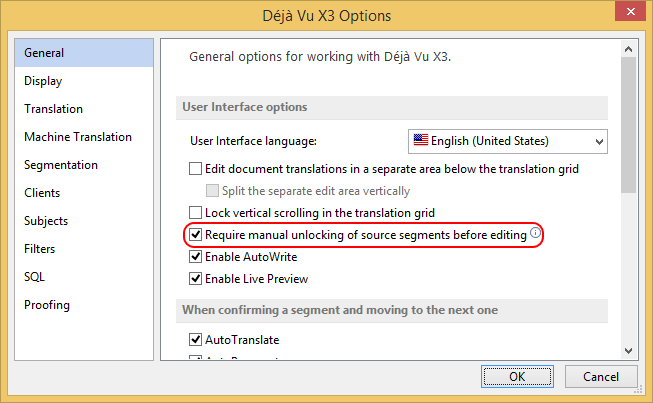 By default, Déjà Vu X3 will not allow you to edit the source text in a project, i.e. the text that appears in the left hand side column of the translation grid. This is done to prevent users from inadvertently making changes in the source text of the project that may cause problems laternote. Normally, it is best to leave the source text locked. There are some situations in which being able to edit the source text in a project is useful, so Déjà Vu does allow you to unlock one or more segments from the source and edit them. How to unlock source segments for editing? You can unlock the source of an individual segment, or you can unlock the source of all segments. Access the Home section of the ribbon, then the Segments subsection, then click on the button labelled Unlock Source Segment. You can also click on the small downward pointing triangle on that button to see a submenu, in which you can click on Unlock Source Segment. This will unlock the source text of the segment that is currently active in the translation grid. Access the Home section of the ribbon, then the Segments subsection, then click on the button labelled Unlock All Source Segments. This will unlock the source text of all the segments in the project. How to lock source segments for editing? If you have unlocked the source of a single segment, the source of that segment will be locked again when you move the cursor out of that segment. If you have unlocked the source of all the segments in the project, you can lock it again by accessing the Home section of the ribbon, then the Segments subsection, then click on the button labelled Lock All Source Segments. The highlighted option determines whether Déjà Vu X3 locks editing of the source by default. We recommend that it be enabled unless there is a specific need to disable it.